Completing your field work in time and within your budget can be hard to do unless you have the right professional equipment to do so. When it comes to excavator hire, you have to keep a few things in mind. Buying the equipment is extremely expensive, even though you may use it several times and with several different projects; it is not a smart investment to make. 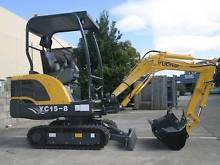 Excavator hire is costly, even when you’re renting it, with daily costs as high as $150 dollars to $1000 on the big 5 tonne machines. In addition to the high costs that come with purchasing sophisticated high-end technology, we can offer different available machines and equipment for you to organize your work on short notice, with the most professionally trained crew that focuses on helping you finish your work on time, with no incidents, in the quickest most committed way. Asides from the initial cost buying a machine would mean to your business, you will be free of all the responsibility that entails such high quality complicated machines, and maintaining them in top quality. Drilling companies in QLD and NSW, offer an ample catalogue of machines and services, including Drilling rigs which are massive, enormous structures that will assist you into drilling water or oil wells, or even wells made of natural gas. When the drilling rigs are too big for a one man operation only, we have a trained crew of specialized people ready to help you on site with even the hardest, most challenging drilling projects in the QLD and NSW area. The type of equipment you choose will depend on the type of work you need to get done. The size and extent of the job will require different sets of machines, and in some cases you may need to remove soil, rocks and dirt, for which excavators are perfect to finish the job for you. The costs of renting excavator hire, drilling rigs, breakers, etc., will depend on the hours of usage. You should prepare everything that may be needed during the completion of your project, so you optimize the usage of the equipment during the rental hours. Always remember, time is money. Try to plan ahead to see what other tasks are in order, prior to using the machines, such as maneuverability, that may be needed in the work, or sloping areas, that may require a special machine or equipment to deal with it. Sometimes trees have to be removed, rocks have to be lifted, relocated or destroyed, so a breaker machine would have to be attached to the excavator you hire. For some work such as house and garden construction projects, the mini excavators, or compact excavators are the best to deal with tasks because you can hire one, and move around the pieces needed to complete your tasks and finish in better time. Some compact excavators have wheels, and some have tracks. It depends on the type of surface and soil you’ll be using them. A mini excavator can be used in reduces areas where you don’t have much space, and it is a large piece of equipment that brings a lot of power to a small area, and can also be used for digging and excavation. That’s why they’re perfect for mini to medium sized projects. Most excavators come with a cab where the driver is supposed to sit, but you need to be driven by a qualified worker, and they’re pricey machines. That’s why excavation hire is the best idea for all kinds of projects.